The life of a farmgirl sure ain't what it used to be. 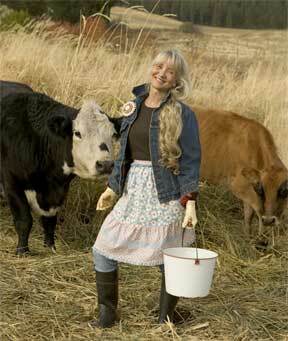 Just look at a day in the life of celebrity farmgirl MaryJane Butters. Sure, there are cows to be milked and chickens to be fed on Butters' small, family-run organic farm in Moscow, Idaho. But a typical workday might also include negotiating a book deal with Random House, writing and designing MaryJanesFarm magazine, testing recipes for a line of organic instant foods for REI, reading the internationally populated farmgirl chatroom on the MaryJanesFarm Website, dreaming up new patterns for the MaryJanesFarm Home line of organic sheets and towels, or giving classes around the country on everything from sewing and crafting to organic eating on a budget. "It's a toboggan ride — no steering!" Butters says of her farmgirl ride to fame. Since buying her five-acre farm in 1986, Butters has been an entrepreneur by necessity, finding resourceful ways to promote her ideal of sustainable living while also keeping her farm afloat. She runs a bed-and-breakfast and offers farm apprenticeships through her Pay Dirt Farm School. Her Country Club allows local residents full access to the farm for a $100 seasonal membership. And her full-color, ad-free magazine can now be found in big retail stores like Barnes & Noble, Wal-Mart and Whole Foods. But the big break came in 2005 with the publication of MaryJane's Ideabook, Cookbook, Lifebook — For the Farmgirl in All of Us, a 416-page, hardcover book that combines farm kitchen recipes and step-by-step crafting and gardening ideas with a mixture of nostalgic farm lore and practical tips for earth-friendly living. While her extended family stayed put to, um, hold down the farm, Butters set off on a nationwide book tour to spread her infectious enthusiasm for the down-to-earth "farmgirl" way of life. "The whole 'MaryJane' thing was hard at first," Butters recalls. "I would think, 'Oh, no — you mean I have to comb my hair this morning?'" But while putting on a public face can be exhausting at times, Butters relishes the opportunity to reach out to her readers. Connecting with people one-on-one is her favorite part of the job, she says. "Fame is good. It extends my reach — and also funds my reach," she says, noting that income from the first book has subsidized the magazine and allowed her to explore new techniques for processing her organic instant foods. And besides, "I'm actually enjoying the occasional hotel room and remote-control TV," she admits with a laugh. Her second book, MaryJane's Stitching Room, was just released in May. This time around, Butters is skipping the extended book tour, but she will pay a visit to Auntie's Bookstore on Tuesday. The new book, featuring "47 Farmgirl Handiwork Projects," is the first of several companion workbooks to the first book. The glossy, full-color pages are sprinkled with inspirational quotes and personal anecdotes about Butters' farmgirl odyssey. Short essays and sidebars profile people and organizations that share MaryJane's vision, such as the Northwest Children's Home in Lewiston, Idaho, where crocheting is one of the many projects that helps young boys find focus and calm in an otherwise chaotic world. The book's lavish photographs of vintage doilies, delicate christening gowns, and texture-rich crazy quilts — not to mention the nuzzling goats and baskets of colorful vegetables – conjure a rustic way of life that many of us might never come close to. But even urban "farmgirls at heart" can find useful projects here. "Eco-tips" include sewing together reusable "Jo Jackets" to bring to the coffee shop; decorating paper sacks for gift-giving instead of wasting wrapping paper; and fashioning plastic grocery bags into a sturdy, reusable shoulder bag. There are instructions for embroidering jeans, crocheting scarves and head wraps, and creating beaded bracelets, retro necklaces and belts, and fuzzy flip-flops. Along with photos and stories, the hands-on book features embroidery designs for readers to photocopy, enlarge, trace, and transfer with a warm iron to towels or table runners. There are instructions for making pinkeepers, whittling a crochet hook, and sewing fancy aprons with ruffles and rickrack, as well as tips for making bean bags, dolls, greeting cards, and dish scrubbies, decorating clothes hangers and tatting hankies. The final section of the book is devoted to a "Crochet Basics" guide. Many crafts books incorporate line drawings and clearly written text, but Butters wanted to provide more: photos of someone's hands holding and using the crochet hook and yarn. The task of putting together these step-by-step instructions was a lot harder than Butters thought it would be. "You forget about the most obvious steps," she says. "That's why everything has to be tested so many times. Creating all those patterns and testing them was a lot of work." But all that work is already paying off, Butters says: "I've had women writing in to tell me, 'I've finally learned to crochet!'" And by passing along this knowledge in her books, Butters is preserving an art form that is on the verge of becoming extinct. 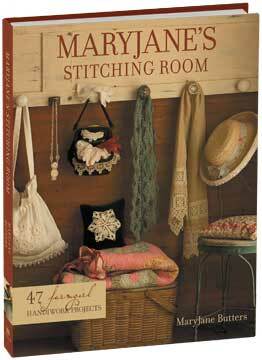 MaryJane's Stitching Room isn't just a how-to guide. It also tells the stories of some of the last remaining practitioners of lace making and tatting — and it profiles young women who are picking up the thread and reviving these age-old crafts. "Handing down knowledge was always part of a farmer's job," Butters writes, and in that sense, she is still very much a traditional farmgirl. Her next book, MaryJane's Outpost, due this fall, will educate women about outdoor living. She'll start with suggestions for enjoying the front porch and backyard, then progress to picnicking and car camping, and finally to hard-core backpacking. "It's a lot of ground to cover, but I love writing books," Butters says. "Selling books is a lot easier than selling potatoes!" MaryJane Butters will visit Auntie's on Tuesday, June 5, at 7:30 pm to read from MaryJane's Stitching Room. Call 509-838-0206.